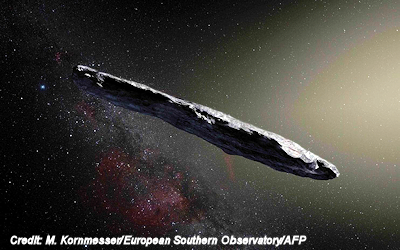 Is the Interstellar Space Object Emitting Radio Signals? inside Mercury’s orbit at tens of thousands of kilometers per hour—too fast for our star’s gravity to catch—‘Oumuamua appeared to have been dropped in on our solar system from some great interstellar height, picking up even more speed on a slingshot-like loop around the sun before soaring away for parts unknown. It is now already halfway to Jupiter, too far for a rendezvous mission and rapidly fading from the view of Earth’s most powerful telescopes. ... this Wednesday at 3 p.m. Eastern time, the Breakthrough Listen project will aim the West Virgina-based 100-meter Green Bank Telescope at ‘Oumuamua for 10 hours of observations in a wide range of radio frequencies, scanning the object across its entire rotation in search of any signals. Breakthrough Listen is part of billionaire Yuri Milner’s Breakthrough Initiatives program, a collection of lavishly-funded efforts aiming to uncover evidence of life elsewhere in the universe. Other projects include Breakthrough Starshot, which intends to develop and launch interstellar probes, as well as Breakthrough Watch, which would use large telescopes to study exoplanets for signs of life. If ‘Oumuamua is in fact artificial, the reasoning goes, it might be transmitting or at least leaking radio waves.